Burleith Park is in the seaside city of Victoria, one of thirteen communities that form the Capital Regional District of British Columbia. 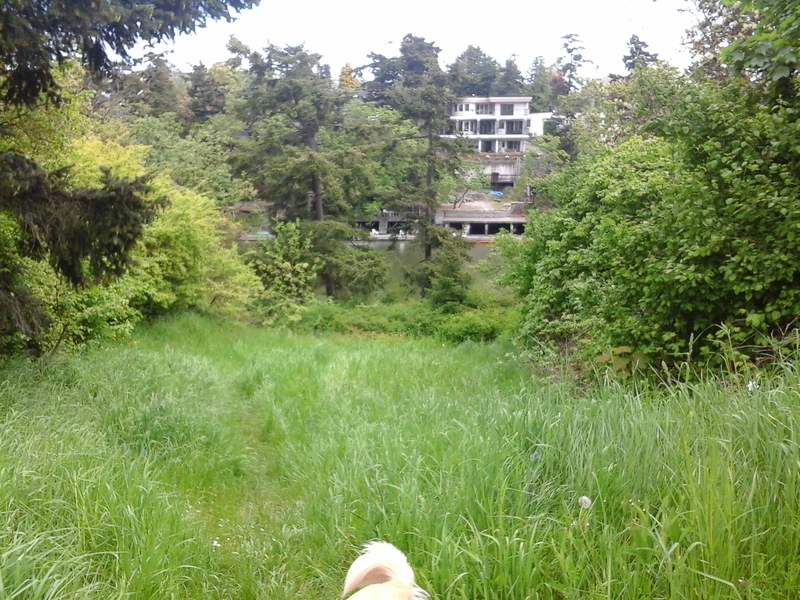 This discrete quarter of a hectare waterfront park is mostly a lovely grassland natural parkland. The rough path through the meadow leads down slope to a rocky outcrop. There is no easy access to the water although there is a muddy cove a low tides. Come here to enjoy peace and quiet as well as the weeping willow, tall Garry oak and shoreline arbutus trees. There are also lots of blackberries and rosehips. This park is a portion of the gardens for the property which hosted the Burleith mansion that was built in eighteen ninety two for James, the son of Robert Dunsmuir, and his family. The property was subdivided in the mid nineteen thirties. Part of the park is the road right of way to Gorge Waters to this section called the Victoria Arm. The Victoria Heritage Foundation has further information about the history of this area. Burleith Park can be reached from the Trans Canada Highway. Continue along the highway as it becomes Douglas Street. Turn west onto Bay Street and continue across the Point Ellice Bridge. At the first lights turn right onto Skinner Street (a sharp right puts you onto Tyee Road). Skinner Street turns to become Craigflower Road a couple of blocks along. Turn right on Burleith Crescent and continue to Selkirk Avenue. Burleith Crescent continues to the right across Selkirk Avenue. There is limited roadside parking along Selkirk Avenue. A city bus travels along Craigflower Road from downtown.